Close to where I spent my teenage years is a meat market and bakery called Landes Meats. The owners are German Baptist. The food there is incredible! In fact, I have a mile long list of favorite foods from there. It’s not far from where I work now but in the opposite direction from the direction I need to go home so the visits to Landes Meats are few and far between. 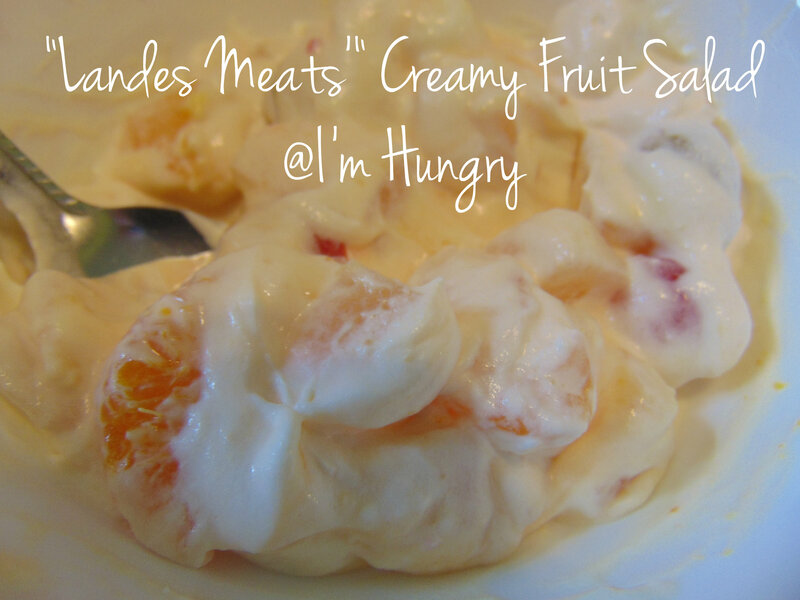 One of my favorites is the Creamy Fruit Salad. I usually buy two containers of the salad and savor it for days afterwards. Since I can’t get there often, I decided to recreate one of my favorites. Once you try it, you’ll see why it’s one of my favorite fruit salads. In a large bowl, place the fruit cocktail, undrained. Sprinkle the yogurt over the fruit cocktail. Set aside for at least 5 minutes. Add the maraschino cherries and mandarin oranges. Stir to combine. Fold in the Cool Whip and marshmallows. Refrigerate for a least an hour. Enjoy as a delicious dessert!